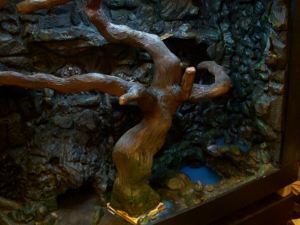 This next hobbyist not only provided some pictures, but also has some videos to show some of the process he took to create a traditional landscape and a non-traditional landscape. Check out the Dragon head! I might have to create this some day. 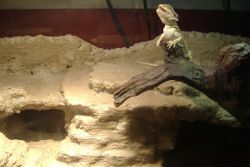 Check out his other video whereby he created a much more natural looking lizard landscape. 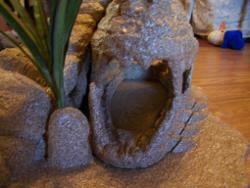 Look at these hobby ideas and come up with your own landscapes for your pet gecko or bearded Dragon to enjoy. 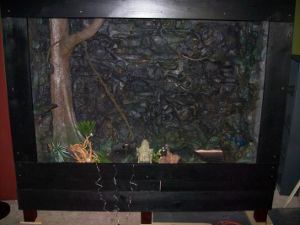 You don't know how much you can improve your reptile cages until you get creative. 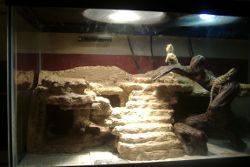 Check out the reptile cages below, the creator has a nice ancient ruins motif going on. This structure has a grand staircase right up the middle with a basking area on either side. 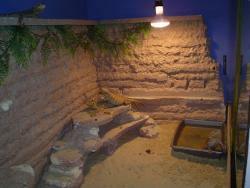 Under the basking areas are some resting areas including a cave that opens on the left side and continues to the right, opening near their water dish. There is a peep hole built into the left wall allowing viewers to see into the cave along the back. 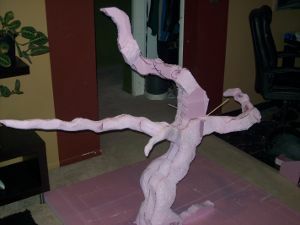 To add to the structure, I included a branch that was purchased and incorporated from the beginning of it's design. 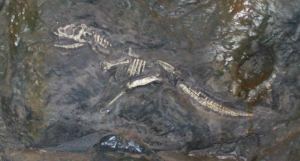 Here we have an exstensive project that includes a bonsai tree, and a set of T-rex bones! 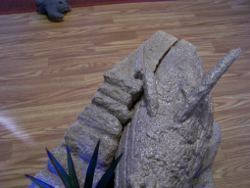 For the T Rex bones, I bought a T rex bones model at Hobby Lobby and cut out an area in my backround. 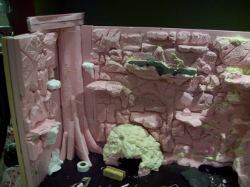 I glued it in and put my grout mix over it. After that I took a rag and wiped off the areas I wanted to be exposed. Besides watching your vids. many times, I just did what you explained in yer videos. The tree is based off a "Kapok" tree that I looked up on line! 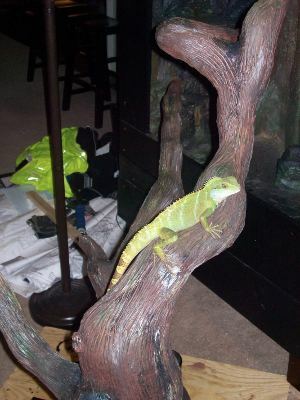 I am working on a sweet lookin tree that is more like a crazy bonsai tree for my Chinese Water Dragon to climb on. 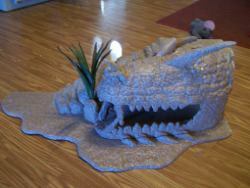 Here's some more hobby ideas for your bearded dragon cages. 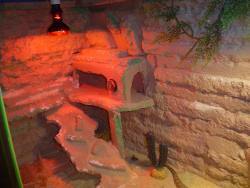 There's a whole family of bearded dragons livin' in this giant reptile cage!